It’s not everyday that a new piece of equipment is launched. But when a company does, it’s unusual, even in these times of a downturn, not to do so without some fanfare. So when a company launches not one, but multiple pieces of equipment it has to make a serious statement. This is exactly what Sandvik did following the release of not only two new drill rigs, but the world’s largest drifter, new underground drilling equipment, multiple new drilling threads and bits, and the latest developments in its automated and tele-remote mining systems. It brought together more than 300 people from ten countries to demonstrate its new equipment in the flesh during its massive customer day. The group gathered at its Tampere facility in Finland to see the latest developments. The facility itself was also on show, asthe visitors tramped across the site which Sandvik claims is the largest miningmachinery manufacturing facility in Europe. As we crossed through the gates a little piece of Australiana welcomed the groups, a ‘beware of kangaroos’ sign, greeting visitors. Quickly the group was ushered in, where we were given a first hand demonstration of its AutoMine system. Combined with the appropriate level of Finnish metal music. Much in the vein of its competitors’semi-autonomous and remote or tele-operated machinery, Sandvik's system allows for the real time operation and monitoring of equipment, allowing operators to gain a better understanding and overview of their machinery as it runs. "This provides maximum fleet utilisation through making maintenance and monitoring an easier task and showing the best way to optimise your fleet's operation. "It allows for greater knowledge of your production rates, how to utilise payloads and further up the chain it provides the data for analysis as well as predictive maintenance." Soon after this the group was transferred outside, crossing the facility and taking in its drills being prepared for shipping along the way. The first stop was a demonstration of its new rockbolting system. 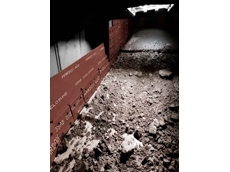 The system provides a reference for operators during rockbolting and roof support. Using lasers attached to a bending boom, it provides an accurate measurement and distance for the next hole to be drilled automatically. "A laser reference fan is used to provide greater accuracy in rockbolting, and as the laser is attached to the bending boom it can stay at the same angle each time, and operators can also easily modify the angle as well," Sandvik stated. "This means you can get the co-ordinates on a USB, plug it in and just start, instead of having a man go into the tunnels onto a work platform and paint the points for the boom to drill." The tour soon led into the production facility itself. Sandvik demonstrated how parts were machined on site. Sandvik explained that it took a modular approach to manufacturing on site, using multiple modules and assembling the machines to a certain point, after which they were moved on to the next module "which allows for a very fast turn around". It has two assembly lines as well as 'hospital bays' for urgent or modification works. They stated that with the process it takes only 25 days from the time a machine starts at the first station until it is ready to be driven out. Interestingly the company takes an inclusive approach for all workers, posting KPIs and current progress rates openly along the floor, which not only shows performance, but also highlights any existing issues in manufacturing and allows for swift appropriate action. It has also utilised its factory space by using a high picking unit storage system on the site. The facility also uses line side storages to buffer the need for small parts "and we always have parts for the next two drills available, which prevents shortages of commonly used parts". While the Tampere facility has taken the lead in the company's assembly process, unsurprisingly it is Australia that is leading the way when it comes to safety. Sandvik's APAC operations managed to achieve a full year with no lost time injuries, reaching the milestone in late August. It has also carried out a hand injury campaign, aimed at cutting the number of injuries across its facilities. The main drawcard for the day was the release of a huge swathe of machinery - drills, jumbos, and drill bits. The major release was its two new surface drilling rigs - a top hammer and down the hole hammer version of the revived Pantera line. The new Pantera rigs are known as the DP2000 in the case of the top hammer drill, and the DI6400 in the case of the down the hole rig. Speaking to Jan Petzold, Sandvik's vice president for mining, drilling equipment product lines TH and DTH, he told Australian Mining that although it is an old name (they stopped producing the Pantera line in 2006) it is a new family of percussive drilling machines. "People are missing the names in drills, and lately it is just a list of letters and numbers for drills, so we are going back to what customers prefer," Petzold explained. A major change to the release is the inclusion of the down the hole rig, as previously the line was only top hammer drills. While both are being released by Sandvik at the same time, only the top hammer was on display at the show as the down the hole rig was unveiled at the Euro Mining 2013 event. Petzold added that these huge drills"have been as the customers are asking for larger and more reliablerigs". 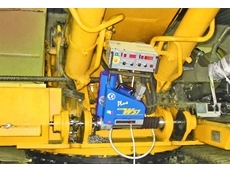 Both have been built to allow for automation configuration according to a site's needs, with options such as tele-remote operation for all functions, automatic feed positioning and alignment, data collection, and navigation via GPS. Sandvik says the Pantera DP2000 top hammer drill is designed for vertical and inclined drilling of 152 to 178 mm blastholes up to 36 metres in depth, for wall control, pit development and production drilling applications. In a similar vein to the revivalof the Pantera line, Sandvik has revived its Axera family, dubbing the new underground drill the Axera DD422i, stating that it is the next generation of drills. According to Sandvik these rigs have been developed specifically for 'intelligent development drilling' and have new drilling and boom control and features a 'next generation carrier'. Coming in at a height of 3.15 metres highand 2.31 metres wide the machine weighs approximately 2.6 tonnes and has a drilling coverage, using a RD 525 rock drill, of 10 274 mm by 6590mm. 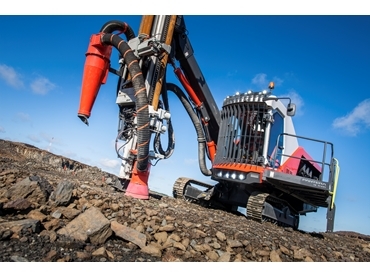 Sandvik stated that the DD422i's "high torque drilling control system is designed to minimise the jamming of rods and consumables," cutting the potential downtimes, adding that the"advanced boom control also provides better manoeuverability and precision in boom movements". The company has broken new ground with the launch of the world's largest hydraulic top hammer rock drill - the RD2045C. It was developed for the DP2000 top hammer drill, and the 45kW rock drill is able to drill holes of between 152 to 178 millimetres in diameter. "Our new RD2045C makes up part of a complete, integrated drilling system in which percussion energy transfer is optimised from piston through tools to rock, allowing the efficiencies of hydraulic top hammer drilling to be applied in large diameter drilling applications," Jukka Naapuri, the product manager for top hammer production drills, explained. Its construction is based on three main body modules that are tied together with four strong, short side bolts, along with only two moving parts within the percussion mechanism. "For the first time in the market, RD2045C introduces a closed-loop shank lubrication system for surface drills," he added. "This environmentally friendly closed-loop lubrication technology is an example of how we integrate EHS in product design." It has also released a new hammer for its down the hole drill rig, the Pantera DI6400. This hammer, known as the RH460, features anew design. It uses a V-Lock system and incorporates oil grooves to ensure better lubrication coverage, while the piston bearing area has been increased. "The main change in design has been expanding the piston bearing surface, which decreases the force of the impact and disperses distress waves, while the grooves helps to dispense the oil and lubrication better," Sandvik told Australian Mining. The taper lock system helps keep the halfsleeve in place, minimising movement. Australian Mining attended the Customer Day courtesy of Sandvik.